Blake Schwarzenbach of Jawbreaker onstage at the House of Blues. They don’t typically make episodes of “Behind the Music” about DIY punk bands, but if they did, the one about Jawbreaker (which played Boston for the first time in 23 years Friday night) would be appointment viewing. In the early ’90s, the Bay Area trio earned a modest but obsessive following with their gritty pop-punk and singer-guitarist Blake Schwarzenbach’s diaristic lyrics, which read like postcards from a broke, lovelorn, and Kerouac-obsessed post-adolescence. Yet that same fanbase turned on Jawbreaker when the band committed the ultimate ’90s punk sin of signing to a major label, and the trio soon succumbed to a breakup that seemed too acrimonious not to be permanent. As is often the case, the legend of Jawbreaker grew in their absence, with even their major-label flop, “Dear You,” becoming a sacred text for a generation of emo bands. In some circles, the prospect of Jawbreaker riding again was spoken of in the same hushed tones usually reserved for rumors of Talking Heads or Smiths tours. When it finally happened in 2017, it tasted all the sweeter for having never felt inevitable. That’s a lot of baggage for one House of Blues gig, but two years of post-reunion shows have whipped Jawbreaker back into fighting shape. Even in his twenties, Schwarzenbach sounded like a middle-aged smoker, so the raw hoarseness of his voice was a feature, not a bug. Meanwhile, when his thick, distorted power chords melded with Adam Pfahler’s propulsive drumming and Chris Bauermeister’s rubbery basslines, they achieved a fusion of melody, noise, and pure energy so exquisite it moved multiple middle-aged dudes to throw their tallboys to the heavens. 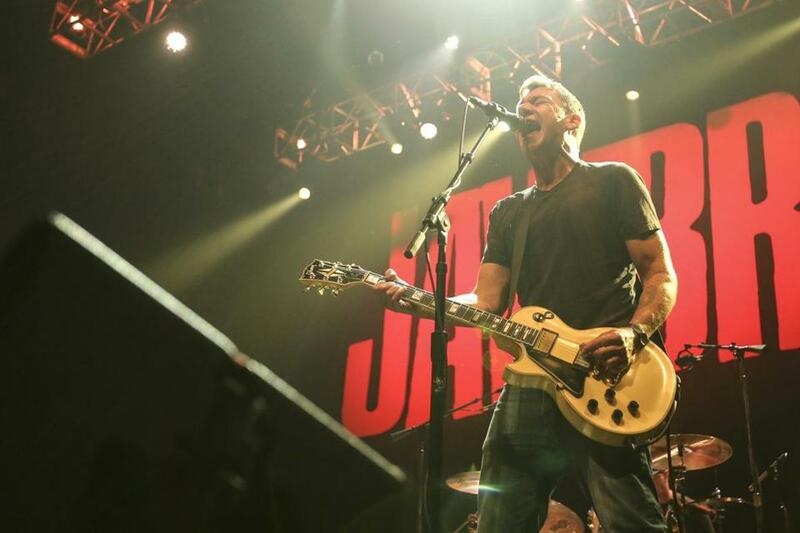 Opening with a barrage of adrenalized anthems from their last two albums, 1995’s “Dear You” and 1994 fan favorite “24 Hour Revenge Therapy,” Jawbreaker ensured that everyone who’d waited decades to shout the choruses of “Save Your Generation” and “The Boat Dreams From the Hill” got their wish. The set’s moody midsection was just as satisfying, with Schwarzenbach digging deep for a devastatingly tender vocal performance on “Ache” and the band wringing every drop of catharsis from the towering melodramas “Accident Prone” and “Jet Black.” Following all that despair, the bouncy pop-punk of “Gemini” and “Want,” though far from Jawbreaker’s most profound work, provided more than welcome opportunities to pogo the pain away. Schwarzenbach has been teasing new Jawbreaker music for a while now, and he continued to stoke such speculation after playing an unreleased song from his old side project Thorns of Life, deadpanning “this is the direction we want to go in — peppy, but with a guarded optimism.” Friday night, however, was not a night for road-testing new material, but for celebrating what Jawbreaker had accomplished. That celebration reached peak euphoria with the encore’s one-two punch of “Boxcar,” perhaps the definitive rebuttal to punk scenester puritanism, and “Kiss the Bottle,” an unflinching yet empathetic depiction of alcoholism in the grand tradition of the Replacements. Jawbreaker reuniting at all was incredible enough, but for the band to have come back so strong? That almost feels too good to be true. Terence Cawley can be reached at terence.cawley@globe.com.